the alix boards are very well supported in the last 8.09.1 kamikaze x86 images. and I’ve extracted it to the CF card using dd. 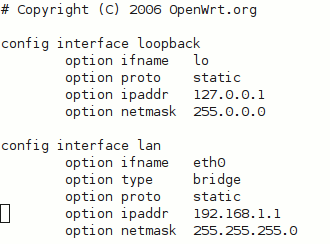 … OpenWRT boots … it’s amazing how fast! this will also disable telnet, making remote access only possible through ssh. At this point the system is ready to be configured using the shell or the web interface. This entry was posted in howto and tagged alix, embedded, howto, openwrt, tips. Bookmark the permalink. mi chiedevo, senza cavo seriale non si puo fare nulla? non posso collegarmi direttamente alla rete? Probabilmente dovrai modificare qualcosa in /etc/config/network o sul tuo computer per far funzionare la connessione.